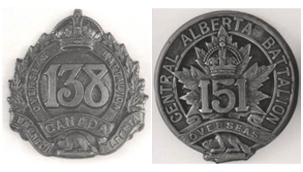 While the 49th Battalion was experiencing their first shock of trench warfare, back in Edmonton two more new infantry battalions began recruiting for overseas service – the 138th in November and the 151st in December of 1915. The Loyal Edmonton Regiment Military Museum proudly supports Valour Place, a temporary home away from home for injured soldiers, veterans and their families while in Edmonton for medical treatment and rehabilitation. A century after he was killed in action the remains of a First World War soldier have been identified. Germany declared war on France on August 3, 1914. The next day the German Army marched through neutral Belgium as part of their plan to knock out France. In defence of Belgium, Britain declared war on Germany on August 4th. On October 7, 1914, four days after the 1st Canadian Division had left Canada for England, orders were sent from Ottawa to regional divisions and military districts across Canada for the mobilization of a Second Contingent of 20,000 soldiers. Legend has it this infamous "War Stories Helmet" was passed around by veterans at mess dinners and reunions whereupon the wearer of the helmet would be required to share a story of dubious credibility. The Loyal Edmonton Regiment Military Museum is proud to announce it has been fully accredited by the Alberta Museums Association’s Recognized Museum Program. William (Billy) Antrobus Griesbach was a prime example of a citizen soldier – then and now. The Second Battle of Ypres raged from April 22 to May 25, 1915 and elements of the first Canadian contingent to go overseas were involved. In the summer of 1915, the 2nd Canadian Infantry Division was about to join the 1st Division in France to form the Canadian Corps. A third division was already in the works. New units were needed for the expanding Corps and replacements were needed by the units already fighting in the front lines. Across Canada new infantry battalions were being authorized to meet those needs. In Edmonton, two new battalions started recruiting – the 63rd and the 66th.